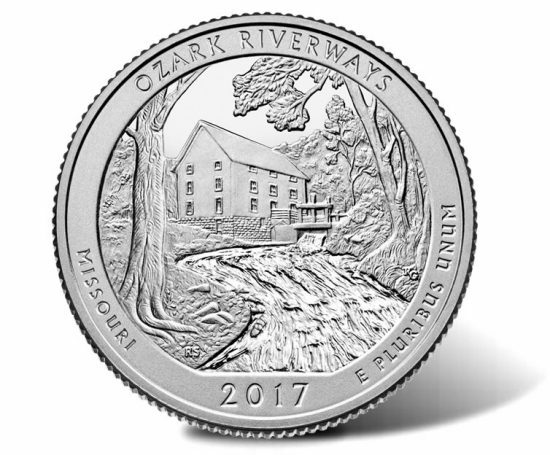 On June 5, the United States Mint began selling the 2017 Ozark National Scenic Riverways 5 Ounce Silver Bullion Coin to its network of authorized purchasers. The new bullion coin features the same designs as on the circulating Ozark National Scenic Riverways quarter. First day sales hit 17,200 and that number did not change the rest of the week. These coins are intended for silver investors and feature the same designs on the Ozark Riverways quarter, which also debuted Monday. Representing the national riverways in Missouri, this latest 3-inch diameter silver strike is the U.S. Mint’s third of five 2017 America the Beautiful 5 Ounce Silver Bullion Coins and the thirty-eighth overall in the 12-year program that began in 2010. Consumers wanting one of these bullion coins can buy them from coin dealers and precious metal firms for a small premium above their melt value. As for collector coins that the U.S. Mint sells directly to the public, the 2017-W Proof American Eagle Silver led the silver contenders in the Mint’s weekly sales stats. The individually-packaged proof coin’s total rose by 2,824 to 265,963 and has been on the market since March 23. Initial sales results of the newly released 2017 Silver Proof Set will follow in the next report. The table below shows the latest sales stats for collector coins and related silver products from the U.S. Mint. Sunday, June 4, is the as of date for the standard collectibles and Friday, June 9, is the as of date for the bullion products.